United States Senator Robert Menendez (D-New Jersey) has been indicted on federal corruption charges, federal authorities have announced, including eight counts of bribery. He denied any wrongdoing and insisted that he is not going anywhere. 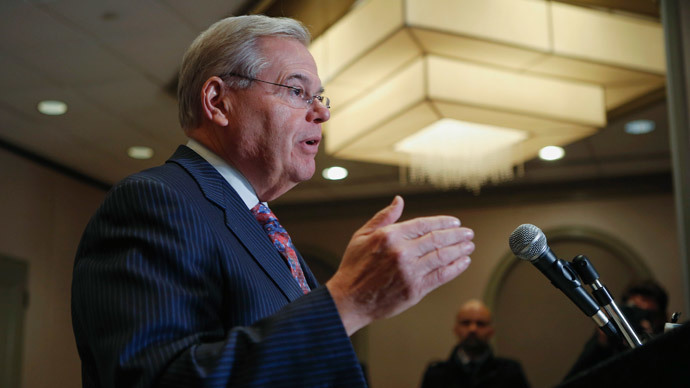 Following news of the indictment, Senate aides told Reuters that Menendez will temoporarily step down as the top Democrat on the Senate Foreign Relations Panel. He is set to appear in court in Newark on Thursday. The two were each indicted on one count of violating the travel act, eight counts of bribery and three counts of honest services fraud. Additionally, Menendez was also charged with one count of making false statements, according to Peter Carr, the Justice Dept. spokesperson. Speaking to reporters, Menendez was defiant in the face of the indictment. The senator accused prosecutors of not knowing the difference between friendship and corruption, adding that they "twisted" his relationship with Melgen into something wrong. "I have always conducted myself with accordance with the law," he said, asking people to withhold judgement and remember that prosecutors can get things wrong. Although Menendez described his address as a press conference, he did not take questions from reporters. An indictment unsealed in US District Court for the District of New Jersey alleges that Menendez provided free flights to his guests on private jets owned by Melgen’s company, Melissa Aviation, between 2003 and 2011. In addition to accepting free flights, Menendez allegedly accepted luxury stays in Paris, a villa in the Caribbean and access to an exclusive resort in the Dominican Republic. He is also charged with taking expensive meals, golf outings, and hundreds of thousands of dollars towards his 2012 re-election campaign. Additionally, Menendez purposely declined to report these gifts in his Financial Disclosures Report, which are mandated by the Ehthics in Government Act. “Menendez used the prestige, authority and influence of his status” as a Senator to promote Melgen’s personal and business interests with an American ambassador and government officials, according to the indictment, including cabinet officials within the administration of President Barack Obama. The indictment alleges that the senator used his power in office to assist Melgen and his associates in return. For example, it states that Melgen's foreign girlfriends were able secure visas due to the unfluence Menendez was able to exert over the proceedings. He also allegedly kept US Customs and Border Protection from sending screening and surveillance equipment to ports in the Dominican Republic, a move that would have otherwise posed a threat to Melgen's exclusive cargo screening contract.